This is the first part in a series where I will go through the basic aspects of playing blues on the guitar. It’s a good idea to have some idea of how playing the blues works as a guitarist. Pretty much all contemporary, popular styles of music have evolved from the blues. Learning the structure of the blues can lead to insights into other styles of music, as well as giving you things to play that can serve as common ground when you get together to jam with other people. The blues is a relatively simple style of music. Granted, musicians can still spend years or even decades delving into the rich history of the blues. But, the complexity often lies in the subtle nuances of playing this music. Learning the more basic structural aspects of the style isn’t too difficult or complicated. This series will start off with beginner guitarists in mind. I’ll assume the reader has little to no knowledge of chords and scales on the guitar, and I’ll keep explanations of things as simple as possible. The goal is for a beginner guitarist to learn some basic things that will enable them to participate in this style of music. I’ve chosen to start this series by focusing on the 12 bar blues chord progression. Everything else that goes on in the blues is based around this chord progression, so it makes sense to start here. The blues progression is a chord progression comprised of three chords and is 12 measures long (another word for a measure is a bar). A measure is a grouping of a certain number of beats. In blues, a measure is usually 4 beats long. The three chords that comprise the blues progression will be different depending on what key you are in. 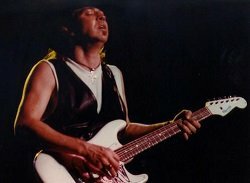 Most blues songs are structured around the blues progression. The progression will happen over and over again, while singing or soloing takes place over the chords. To play through this chord progression you would just have to come up with a strumming pattern of some sort that is 4 beats long, and apply it to each measure in the progression. There are almost countless different ways you could strum through this progression. It’s easy to figure out how the progression will work in keys other than E. First, we’ll need to take a step back and look as a few basic things. In any key, there is a group of seven different chords that are the chords for that key. When people analyze chord progressions in music, these chords are given roman numerals (I through vii). The blues progression uses chords I, IV and V of the key you are in. In the key of E, the I chord is E7, the IV chord is A7, and the V chord is B7. The I chord shares the same letter as the key itself (an E7 chord when we’re in the key of E). As long as you are straight on where the notes are, all you need to do is find the root of your I chord on the 6th string, and the roots for IV and V will be right underneath it as shown above. For example, if we look back at our chords in the key of E, you can see that an E note is on the open 6th string. The A note (IV) is right below it on the open 5th string. B (V) is just 2 frets up from the A. Once you find your root notes, just make them in to Dominant 7th Chords (E7, A7, B7 in this case) and you’re ready to go. Just to help with another example, let’s say we are going to do a blues progression in G. First, we’ll find the root note of our I chord on the 6th string. This puts us on the 3rd fret, where we have a G note. We know that the root note for IV is on the same fret, but the next string down. This puts us on a C note. We then can move up 2 frets from it, which puts us on the root of our V chord (D). So, for the root notes we have I=G, IV=C, V=D. Make them all into Dominant 7th Chords, and we end up with G7, C7, D7. Make the three root notes into dominant 7th chords and figure out how to fret them if you don’t already know. It’s good to be aware of some of the common variations in the blues progression. Usually within any given blues song, the chord progression will stay the same as it occurs over and over again. But, from one song to the next there might be some slight differences in the progression. Here are a few of the most common variations. This sums up how the blues progression is put together. In the next part in this series, I’ll go over the blues scale, the most commonly used patterns for it, and how to move it around the neck of the guitar for playing in different keys. Articles after that will focus on things like turnarounds, riffs you can do in place of the chords in the blues progression, and common blues standards. Posted in Resources, The Blues and tagged Beginners, Blues, Chord Progressions, Theory. ← Should You Learn to Read Music?